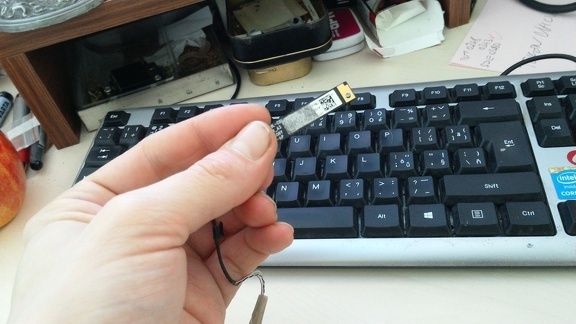 I was thinkig about how to use webcam modules from old notebooks in the past but never tried - yesterday I was searching in my box with RAMs and I found such webcam module in it - with rest of wires, just prepared to try :-) So I decided to try it today - will it work or not? 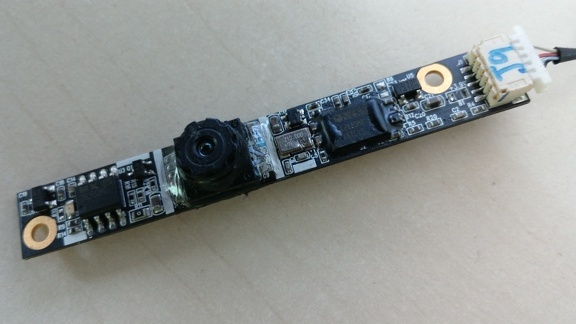 On the internet I found that such modules are usually regular USB webcams, so there are 4 wires - 2 of them delivers power - +5V, GND, and two of them are USB bus data - D+, D-. If you look at the wires comming out from the module, two of them are twisted - these will most probably by the USB data wires (D+, D-), the other two are most probably power and ground. 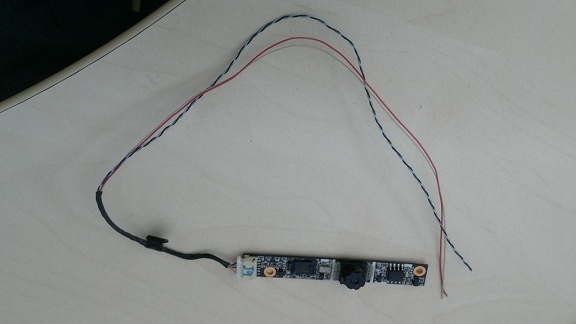 So I took multimeter and verified that one of the non-twisted wires is connected to "ground" of the module and the second one is wired to U5 which I found is the 3.3V regulator - so these are for sure +5V and GND, so the twisted ones must be USB data. 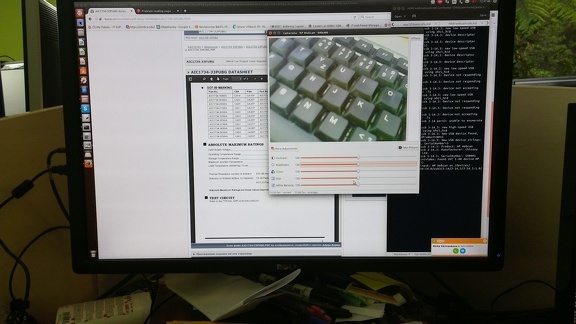 So I took some USB cable, cut out one of its ends and soldered it onto webcam module - +5V to +5V, GND to GND, but how to find out which one is D+ and which one D-? I used trial and error - there are only two possibilities and in case you swap these wires, nothing will happend, PC just will not recognize the device. 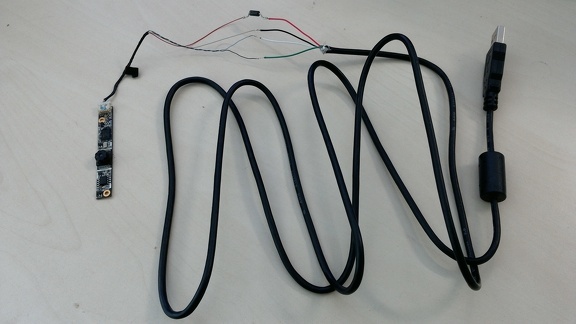 You may notice a diode in +5V wire on the picture - explained bellow. [943893.569200] usb 3-14.3: Device not responding to setup address. [943893.773186] usb 3-14.3: Device not responding to setup address. [943894.049173] usb 3-14.3: Device not responding to setup address. [943894.253171] usb 3-14.3: Device not responding to setup address. OK, most probably D+ and D- are swapped, so I took and soldering iron againg and swapped these wires. [944009.233266] usb 3-14.3: Manufacturer: Chicony Electronics Co., Ltd. 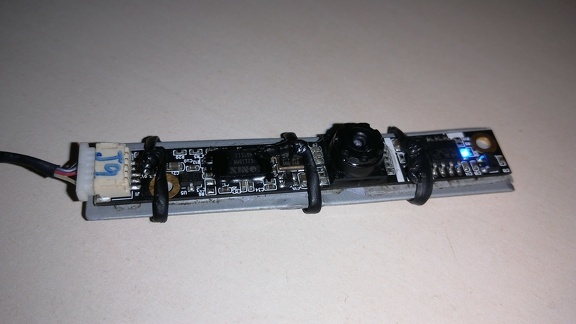 If you look closely on the picture of my module, you will find that there is one component missing - it is marked B1 and its near the connector (above C2 and R4) - (most probably pulled out when unscrewing the module?) - and that I shorted it out with a piece of wire, because the +5V input goes through this "B1" to U5 which is 3.3V regulator. There is also note "+3.9V" above B1. So it seems that there was something cutting the +5V to +3.9V to lower power disipation on the U5 (to make it heat less). Therefore I put diode in series with +5V to cut the voltage down. Then if I played with the module for a while, the BGA chip become quite warm and the picture started freezing. So I attached piece of metal at the bottom of the module, to spread the heat out. I also put some thermal-conductive pads between module PCB and the metal plate to not allow the metal to short something on the PCB - with this module seems to run stable.